The best way to get to know a community is by scheduling a tour. 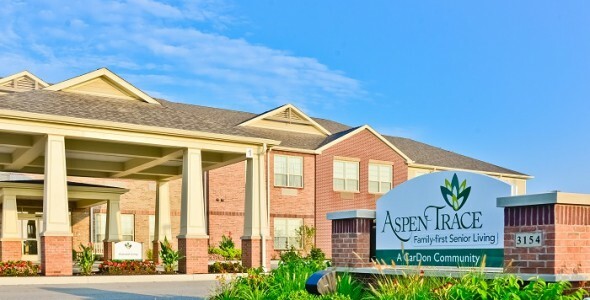 See the facilities, meet the staff and residents, and get a feel first hand what it's like to live at Aspen Trace Assisted Living. From the moment you walk through the doors of our new senior living community, you’ll feel the warmth of family and home – friendly faces, inviting spaces, familiar comforts. Aspen Trace brings the family-first philosophy shared by CarDon communities throughout Indiana to Greenwood, Bargersville, Center Grove and the surrounding area. It’s a philosophy that inspires the exceptional living options and compassionate healthcare services we offer. At Aspen Trace, these include: assisted living, short-term rehabilitation, specialized memory care and long-term skilled nursing care. Aspen Trace offers the perfect combination of home-like casual elegance and convenient access to area amenities – entertainment, shopping, restaurants and more. With Stones Crossing Health Pavilion nearby, as well as other physicians’ offices and specialized medical services, our location is the perfect complement to our progressive approach to senior living and care. At Aspen Trace, you’ll see our family-first philosophy shine through in all that we do to make the living experience truly special. You’ll see it in our thoughtfully designed, comfortable suites and welcoming gathering spaces – and in the variety of services, amenities, and engaging activities we offer residents and family members. You’ll feel the warmth of being part of our family of residents and staff. We welcome family visits and always appreciate the family’s participation, suggestions and concerns. Because we share a common goal – the well-being and happiness of each person we serve – we go the extra mile to ensure the senior living options and health care services we offer meet everything from lifestyle desires to a wide range of personal needs. It all contributes to optimal quality of life for our residents receiving assisted living support, rehabilitative care, long-term skilled nursing care or specialized memory care. Family first is our philosophy at Aspen Trace an approach that goes back to 1977, when CarDon & Associates was first established. Based in Bloomington, Indiana, CarDon is one of the largest providers of senior living options in Indiana, raising the expectations for the entire industry with our commitment to personalized, passionate attention across a continuum of health care needs. Thank you for your interest in Aspen Trace, please give us a call to schedule your tour.